Baguio has made the favorite Filipino taho snack uniquely its own with strawberry syrup and fresh fruit bits. Strawberry taho. Sold almost everywhere in the city, good old-fashioned taho made from soya is drizzled with strawberry syrup and, if one is lucky, fresh strawberries. The slight tanginess of the syrup and fresh fruit bits blend nicely with the soft and creamy soya, making this taho a hit among adults and children. Cafe by the Ruins is a must to visit in Baguio City for its hearty breakfast meals. One of the most satisfying places in the city to have breakfast in, Café by the Ruins serves aromatic, full bodied and flavourful coffee to perk up one’s morning. They also have unique tea infusions for the non-coffee drinker. Also available are a variety of Philippine style hot chocolate drinks, fresh fruit shakes and juices, pure carabao’s milk, special breads and spreads, and comfort food in the form of breakfast meals and sandwiches. Their bestsellers include the delicious, signature Ruins coffee; simple but surprisingly delicious kamote bread; the unassuming Filipino longganisa-sinangag-itlog (uniquely dubbed as “lon-si-log”); classic bacon and eggs; rich blueberry muffins packed with fresh blueberry fruits; and the comfort food kesong puti with basil as a twist. Café by the Ruins serves breakfast from 7:00 a.m. to 11 a.m. daily. The cozy ambience of Café by the Ruins makes diners linger and savor the comfort of the café’s coffee and great food selections. The signature Ruins coffee is served with a piece of tira-tira (a native sugary candy) on the side. The kamote bread served with one’s choice of spread (fruit jam or herbed cheese) and the blueberry muffins of Café by the Ruins are comfort foods that could transform anyone into a morning person. Café by the Ruins’ Ole Nick’s Open Face Tuna is a healthier and great alternative to meat omelette. The Bacon and Eggs of Café by the Ruins is understandably one of the house bestsellers. Their thick and crunchy bacon goes well with hot pandesal and egg. With a modern yet simple façade, the 1000 square meter BenCab Museum appears ordinary on the outside but really bursts with colors and life once inside. msbolin behind one of the paintings of National Artist Benedicto “BenCab” Cabrera. After strolling around session road and Burnham park, head to the BenCab Museum for lunch and cultural sightseeing. Located at the lower third level of the BenCab Museum, Café Sabel offers healthy and interesting food choices such as farm fresh green salad with strawberry vinaigrette, carrot and pumpkin soup, carrot and ginger soup, tomato basil pasta, basil pesto pasta, chicken paprika, tuna with pineapple panini, strawberry shake, cucumber cooler, and a selection of herbed teas. Coffee lovers should also try BenCab’s Brew, which is freshly brewed from native Arabica coffee beans. After lunch, and with a full tummy, it’s time to explore the various levels of the BenCab Museum and see intricate Ifugao sculptures and learn about how life was in the Cordillera’s centuries ago. The museum also has an extensive collection of Mr. Ben Cabrera’s paintings. The colourful interiors of Café Sabel in BenCab Museum lend it a playful and casual vibe. Cafe Sabel’s basil pesto pasta is cooked with fresh basil grown in the farm of the owner, National Artist Benedicto “BenCab” Cabrera. Café Sabel’s Cucumber Cooler has a minty and soothing taste that makes it very refreshing—a perfect summertime thirst quencher. Merienda time is best spent at a quaint little café tucked in a garden near Camp John Hay. If it’s drizzling at noon time in Baguio, sipping hot chocolate from a mug can feel quite heavenly, while chit chatting with friends or reading a book. One can do this at Choco-late de Batirol. They serve sumptuous comfort food to customers seeking refuge from the city’s cool weather. The old and young alike will love their traditional hot tsokolate for its distinct tablea flavor that is not cloyingly rich and sweet. Other hot chocolate drink selections in the menu include Baguio blend (made with strawberries), cinnamon, almond, Cointreau or orange-flavored liquer, Kahlua, and choco mallows. 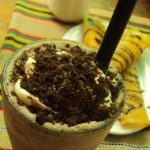 Lovers of cold chocolate drinks will love the café’s flavored variations of ice-cold tsokolate. Snacks such as suman sa latik, bibingka and turon de langka are great accompaniments to their hot chocolate during particularly cold and rainy days. Choco-late de Batirol also serves unique breakfast fare such as longganisa Vigan and tocino kalabaw. It likewise serves a variety of local dishes such as dinuguan, paksiw na lechon, beef caldereta and boneless daing na bangus. Choco-late de Batirol is a quaint cafe tucked into the seclusion of a garden near Camp John Hay. 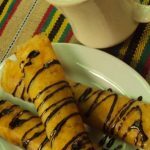 Everybody’s favorite turon with choco syrup on top and best partnered with Choco-late de Batirol’s traditional hot choco-late. The Almond Essence Ice Choco-late of Choco-late de Batirol has a strong almond flavour that perfectly complements the slightly bitter and nutty taste of tablea. Choco-late de Batirol’s suman de latik and hot chocolate are best enjoyed while basking in the comfort of Baguio City’s cool weather. Te Quiero, or “I Adore You” in English, is the in-house Spanish-inspired restaurant of Microtel Inn and Suites by Wyndham – Baguio. An evening in Baguio can be magical at the inhouse restaurant of Microtel Inn and Suites by Wyndham. Te Quiero as the restaurant is called, is Spanish-inspired and serves a wide variety of Western and Asian dishes. Te Quiero’s menu explains that a tapa is originally a small plate or bowl containing a few nuts, olives, cheese or ham, served with wine, beer, sherry or wine, either as a snack or as an appetizer. Nowadays, the range of tapas has become more varied as reflected in Te Quiero’s menu. The restaurant serves cold tapas specialties such as jamon serrano, salami mixto, and picante salchica y queso de cabra. Their hot tapas bestsellers include salpicao de carne de vacuno, caldereta de cabra, and callos a la madrilèna. Te Quiero offers a tapas buffet during their Tapas nights every Friday and Saturday at 6:30 p.m. to 10:30 p.m. An acoustic band plays on these nights and why not order a bottle of very cold beer or a glass of Spanish wine while relaxing and enjoying the music. The creamy leche flan of Te Quiero Tapas Bar and Restaurant is served with strawberries and slices of orange to give a citrusy contrast to the milky flavour of the flan. Te Quiero Tapas Bar and Restaurant of Microtel Inn and Suites by Wyndham – Baguio serves Spanish, other Western and Asian dishes to customers. The chocolate mousse of Te Quiero Tapas Bar and Restaurant in Microtel Inn and Suites by Wyndham – Baguio is what sweet dreams are made of. The Gambas Al Ajillo of Te Quiero Tapas Bar and Restaurant is a sumptuous platter of prawns with garlic, slices of lemons, vegetables and crostini. The great selection of flavorful finds in Baguio City would surely satisfy the craving of any foodie who visits the city. And for the seasoned road traveller, the best way to reach the City of Pines is through Victory Liner, which has been consistently providing safe and reliable bus transportation to Baguio City and other places in Northern Luzon for 70 years now. So this weekend, visit Baguio City and enjoy not only its unusually cool weather but the “only in Baguio” food specialties and restaurants. * A Baguio experience with bed pal Smash who wrote most of the content here. This again, is for my boys as reference should they consider spending a few days in Baguio City. You got to try the signature dessert of Hill Station which is home-made ice cream using local ingredients in Baguio served in a unique artist palette presentation. I love the coffee, chocolate and strawberry when available. Oh, I want to visit Baguio. Gosh, I miss Baguio. I wish I could spend a whole week there. I find that 3 days is just not enough, especially since there are so many places that I love to go to when I’m there. We tried to find Cafe by the Ruins when we were there, year 2012 but we cannot find it. Where is it located? Also I remember that I take a sip of taho before we head to Benguet for a hike. Ahh namiss ko ang bundok! Nearest landmark is Baguio City Hall if I remember it correctly. We hired a taxi driver to tour us around Baguio for a day and thank God he was patient with our requests. And your namiss ko ang bundok remark makes me want to go to Sagada again. I tried Cafe by the Ruins a few years back and I remember not being very happy about the food… I hope they’ve improved! I’m now a fan of your blog, Berlin! Saving this for my return to Baguio. Surprisingly when I went there in Chinese New Year 2014, I didn’t find these restos. Thank you so much for sharing! If in the future you wanna travel & explore/blog/photowalk, count me in! PS: email me your logo, I wanna add it to my favorite section on my blog! Hi Berlin, thank you so much! 🙂 I was actually planning a Batangas trip this year. More on farming ang theme. I wanna interview farmers and local growers. And no problem! Yes I can help you with that. 🙂 Thank you for adding me on FB! Let’s revamp your logo sometime! I’d love to collab & learn with you! Super thanks for the kind help. Anytime re the batangas trip. It would surely be a nice experience. For the revamp of the logo, that would be super great Talaga. Appreciate it. Just message me. Take care always! We love discovering new restos in Baguio. Haven’t been to Cafe by the Ruins though because its always full whenever we happen to go there .. but we love Choco-late de Batirol. Yes, so love Chocolate de Batirol, too. We haven’t been to Cafe by the ruins. thank you for your recommendations Mommy. We can’t wait to visit the city of Pines. I miss Baguio! Looks like you had a grand time there, and every dish looks delectable! Grand time especially if spent with dear friends. Thanks. Yes, tried hotel Elizabeth once. Dinayo pa namin before because of its famous bread. Ihihi. drooling here! sobrang inggit naman.. you have highlighted everything that i’ve been missing from my trips to baguio haha! The strawberry taho the batirol, Cafe by the ruins, sabel… all of the above actually.. it’s been 5 yrs na yata a lot of things have changed.. i gotta go back there. Sayang, tapos Na pala ang panagbenga, it’s the most opportune time to be back in Baguio. Yes, the city has changed; dami Na ring tao, sobra. Haha, me too when I was writing this. I will bookmark this post in case our Baguio dream vacation pushes through this year. We used to go to the veggie place, Oh My Gulay.. I think this place was owned by Kidlat Tahimik. But I don’t know if it’s still operational. I’d like to sip a locally brewed coffee and enjoy the kamote bread in Cafe by the Ruins with my husband and son. Thanks for sharing! Thank you, too, and I hope your Baguio trip will push through this year.And if I happen to travel back to Baguio, I will also try and look for Oh My Gulay. Hope it’s still operational. I haven’t been to Baguio again since 2008! Would love to go back soon and taste strawberry taho again. Ihihi. Yes, Baguio’s strawberry taho is definitely something.